13 Above: Youngest Sailor To Approaches Final Destination..!! Youngest Sailor To Approaches Final Destination..!! American teenager Zac Sunderland headed for home on Tuesday in his attempt to become the youngest person to sail around the world alone. Sunderland pulled out of San Diego aboard his 11-meter (36-foot) boat, Intrepid, after spending about 36 hours in port to clear customs and have his engine repaired. He uses the engine for going into and out of ports, and in case of emergencies such as getting out of the way of ships that might not see him. With about 160 kilometers (100 miles), he's due in Marina del Rey, in the Los Angeles area, on Thursday, 13 months and two days after he left. around the world alone when he arrives in Los Angeles on Thursday. 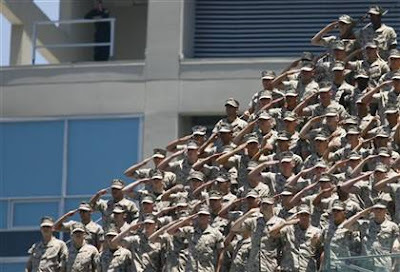 "I'd do it again in a heartbeat," he said on Monday while in port. "It's been an amazing year. Tons of fun, lots of great stuff." Sunderland was 16 when he left Marina del Rey on June 14, 2008. His total trip is estimated at 45,000 kilometers (28,000 miles). Vying for spot in record book Sunderland turns 18 on Nov. 29. The record for the youngest solo circumnavigation is held by Australian David Dicks, who was 18 years, 41 days when he completed his voyage in 1996. US Zac Sunderland, 17, walks in the pier on docking his sailboat "Intrepid" after crossing the Miraflores locks in the Panama Canal on May 19, 2009. 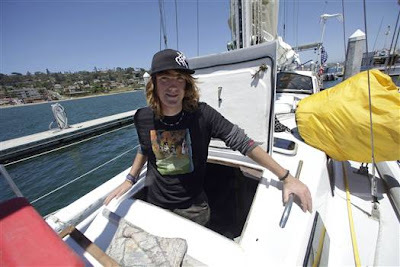 Sanderland left California on June 14, 2008 attempting to be the youngest person to sail a solo global circumnavigation. Also trying for the record is 17-year-old British sailor Mike Perham, who is a few months younger than Sunderland and sailing a bigger, faster boat. Perham has had breakdowns and been forced to stop in New Zealand for repairs, but could supplant Sunderland in the record book. Dodgers and the San Diego Padres Sunday, July 5, 2009 in San Diego. The shaggy-haired Sunderland is from Thousand Oaks, northwest of L.A. His father, Laurence, is a shipwright who has met him at various stops around the world, often to help him repair various damage to the boat.